This was the scene early Tuesday afternoon. 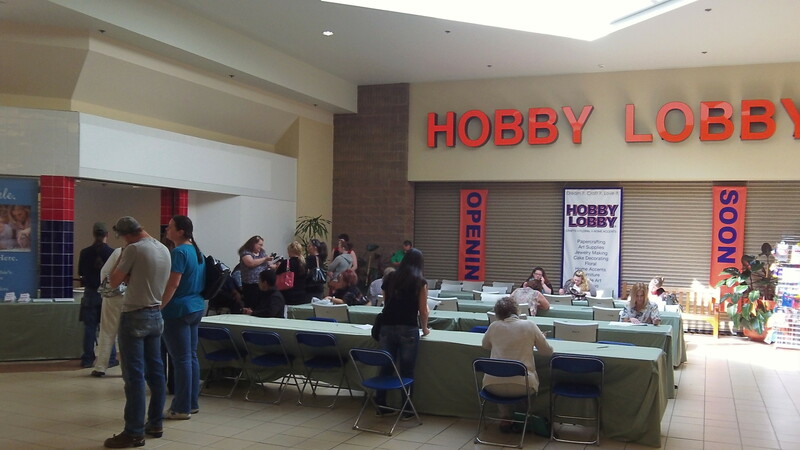 Job applicants were filling out paperwork and waiting their turn Tuesday inside Heritage Mall in Albany, where Hobby Lobby expects to open its first Oregon store next month, “at the beginning of June” as a press release issued on April 11 put it. The company, based in Oklahoma City, has been remodeling space formerly occupied by Old Navy and, years ago, Gotthschalks, a total of about 62,000 square feet. Old Navy moved to other quarters inside the mall. In the April statement, Hobby Lobby said the store will have about 35 to 50 jobs, paying $15 an hour for full-time work and $10 an hour for part-time. The company said last year it planned to open early in 2014. Complications evidently put off the opening date. On Tuesday, the inside of the cavernous space, glimpsed through slits in the papered-over doors, still was empty of furnishings. The outside looked pretty much ready, though construction was still under way. They won’t get a red cent of mine.